The MCX8000 DJ Controller is first native player for Denon’s new music management software engine 1.5, providing DJs with all the features of the software at their fingertips. This exclusive, ground breaking DJ software makes it possible for the user to use the standalone mode without using a computer. Today DJs are able to connect a USB stick, in much the same way they use to use classic CD players – but with all the advantages of a modern DJ system. Create Beat Grids, analyse BPM values, create and edit playlists, update track information – is no problem with the new engine. It is also possible for the engine to import directly from Serato DJ Crates while realizing all Hit Cues. 16 velocity sensitive performance pads for rolls, slicers, cues and samples round off the Denon MCX8000 package. This high-quality media player & controller offers all of the conventional connections that are indispensable for a professional performance. High performance XLR outputs for the PA system and the DJ booth as well as an integrated 24-Bit audio interface deliver a powerful and brilliant sound. The Denon MCX8000 offers two USB inputs, which can be used to connect mass-storage devices with a capacity of up to 2TB, so that there is no need to access a computer during the performance. 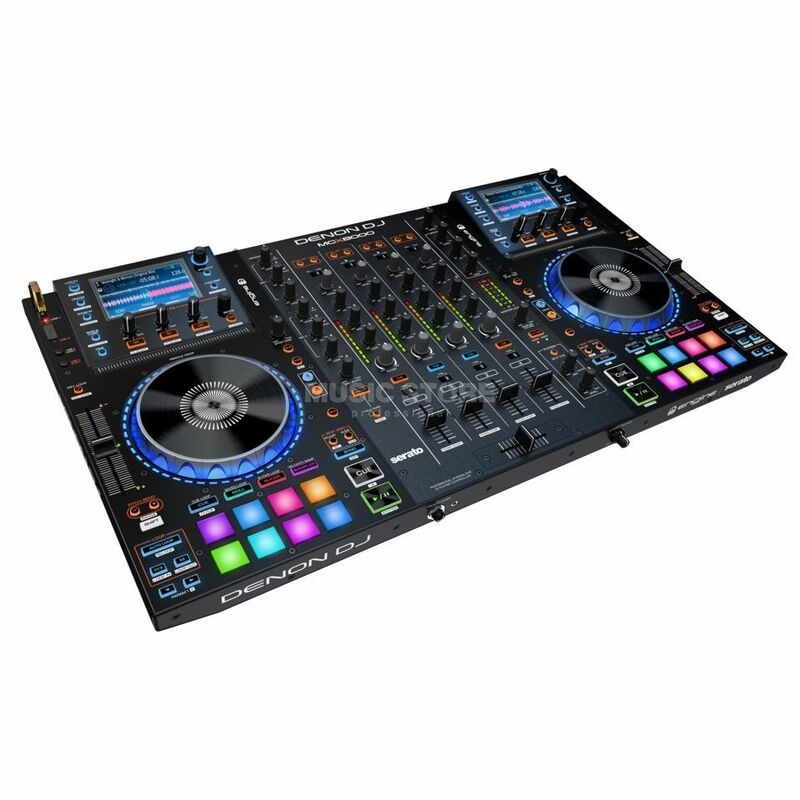 In addition, the controller is equipped with a 24-Bit audio interface and can therefore also function as a MIDI controller for Serato DJ (full-version included). The MCX8000 is equipped with two high-resolution full-colour displays, meeting all the demands of an ideal workflow. Regardless if on the Denon DJ engine interface or in Serato DJ controller mode. Both colour displays show all of the most relevant information such as track titles, cue points, tempo, loop length, timing information, detail and overview envelopes and more. In the centre of this Denon DJ controller is a fully equipped 4-channel mixer section with all the relevant filter controls. Up to 4 analogue sources can be connected and two channels are prepared for use with Serato DJ DVS. This standalone controller also provides three integrated effects for Line inputs and the engine playback. Two separately controllable inputs with Talk-over and Echo have been made available for use with microphones. The high-quality internal craftsmanship and the robust metal housing of the MCX8000 ensure that it is prepared for professional use. If it worked well it would be great. This is a great idea for a controller, but it doesn't work well in stand alone mode. The screens freeze the stand alone app to prep the music on my laptop kept crashing and the key lock is bad quality.